Book your B&B in Sanya through this guide. We have selected for you the Bed and Breakfast with low rates, cleanliness, simple furnishing, often located close to local attractions. The bed and breakfast are also considered an easy tool to know the local culture of Sanya. Sanya Phoenix International Airport 17 km Sanya Railway Station 6.5 km Sanya Pedestrian Street 1 km - Jinjiang Inns is the budget brand from leading Asian hotel group Jin Jiang Hotels, and offers simple, clean, safe and comfortable rooms for business and leisure travelers. 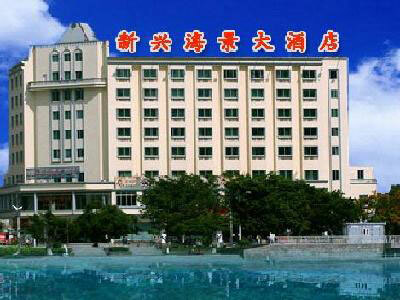 - Whether you are a tourist or traveling on business, Yuelai Hostel Sanya Shui'an is a smart choice for accommodation. 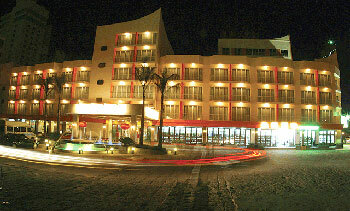 The hotel is 3.0 km from Sanya Railway Station and 3.2 km from Sanya Bus Station. Sanya Fenghuang International Airport is 11.5 km away. From here, guests enjoy easy access to the city's must-see destinations. Is apart from the airport 18 kilometers, only needs 15 minutes by car; from the motor station 1 kilometer, only needs 2 minutes by car, also may walk arrives; from the train station 2 kilometers, also only needs 3 minutes by car., Harvest Ailin Hotel Sanya belongs to the Harvest Group and was set up as a four-star deluxe hotel. It is well received by leisure and business travelers alike. 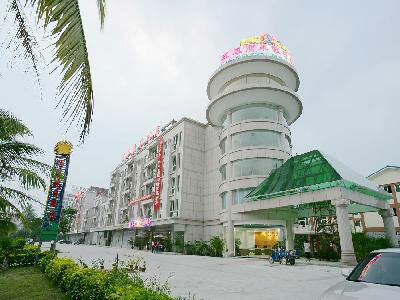 0kms to the city center; 3kms to the airport; 4kms to the port; 3kms to the long-distance bus station; Surrounding landscaple: Da Donghai, Yalong Bay, The End of The Earth, Sanya Guoxi Hotel is a four star rated hotel, solely invested and owned by Mr.Zhang Guoxi, a famous entrepreneur of China. The hotel sits at the most promising section of No.4 Jiefang Road, Sanya City, Hainan Province, 15 minutes from the airport by vehicles, which is very convenient. Distance to airport: 12km Distance to railway station: 2km Distance to city center: 0km, Golden Avenue Hotel offers 100 guestrooms . For dining, it has a Chinese restaurant holding 120 persons and an air garden tea house. This beach hotel provides full equipment and an elegant atmosphere. Distance to airport: 15km Distance to railway station: 3km Distance to city center: 3km, Emerging Seaview Hotel is a three-star hotel with a unique appearance, chic interior decoration, and innovative service, The hotel has a total of 129 rooms, a magnificent song and dance hall, 18 KTV boxes, beauty salons, foot bath, massage, and other recreational leisure venues. In addition, the lobby bar, business center, shopping malls and other supporting facilities will make your stay a perfect one. The hotel is located in the Southern part of Garden Road, Lingshui County, near to South Yelin trunk road, with convenient transportation. 2km from Lingshui bus station; 5.1km from Lingshui Railway Station; 76km from Sanya Railway Station; 81.5km from Sanya Phoenix International Airport., Lingshui Golden Bay Hotel is built and managed according to high quality standard, which is a multifunctional Business Hotel integrating catering, accommodation, conference training and other services items. - 1 km to Jiefang Road Pedestrian Street; - 1 km to Chunyuan Seafood Square; - 2 km to Luhuitou Square; - 4 km to Dadonghai Square; - 8 km to Sanya Railway Station; - 14 km to Phoenix International Airport; - 20 km to Tianyahaijiao; - 23 km to Yalong Bay Resort Plaza., The Wantai Holiday Hotel (Wantai Jiari Jiudian) is located at the intersection of Shengli Road and Heping Road in Sanya, close to Sanya Bay and Yifang Shopping Center. Opened in 2006, the 6-story hotel features 40 guest rooms and suites, equipped with cable televisions, internet access and balconies. Away city center :0km, away railway station : 6km, away airport: 12km, away beautiful star center :600m, away port :2km, away bus station 1km., Sanya fusi business hotel owns 62 business rooms, guestrooms equip big TV, deluxe American-Standard massage and bathe, bussiness computer go on-lining.The first floor of hotel has business caffe hall, which provide all kinds of delicate business meal, dessert and drink. - 5-min-drive to Sanya Railway Station; - 5-min-drive to Sanya Bay; - 15-min-drive to Tianya Haijiao; - 15-min-drive to airport; - 20-min-drive to Yalong Bay., Relax-inn In, Sanya located in the junction of Jinjiling Road East Section and Phoenix Road, is the latest hotel from the Sanya new railway station, only 1 minute drive; distance from known as "Coconut Dream Corridor," Sanya Bay is only 4 minutes, from Phoenix International Airport is only 15 minutes, 15 minutes away from the ends of the earth, 20 minutes from the Bay, transportation is convenient. City center: 5 km; Railway Station: 8km; Phoenix Airport: 18 km;, Yuhai Hotel Sanya is located in the Yuya Road, adjacent to the famous picturesque Dadonghai sea beach. It's the ideal place for leisure and business tour. Sanya Phoenix International Airport: 20 km; Sanya Railway Station: 8 km; 5 km from downtown: Sanya pedestrian street; Ambience: Dadonghai Resort, Luhuitou, Water Industry Seaview Hotel, Sanya under Hainan End of the World water industry group, located in major coastal tourist resort of Dadonghai area, is a quasi four-star luxury leisure resort. Hotel, which covers an area of more than 42,000 square meters, is the only panoramic view Yelin Bay naval port. 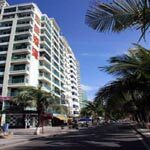 , The Hong Hai Family Hotel (Sanya Honghai Jiating Lvguan) is located within walking distance to Dadonghai Beach and Dadonghai Square. Sanya Phoenix International Airport 12 km Sanya Railway Station 6 km Sanya Pedestrian Street 1.8 km, Sanya rainbow guesthouse next to the famous HaiYue square and a famous Snack street.